* Note: to ensure the safety of our guests and staff, we reserve the right to deny boarding/daycare to any dog who shows aggressive behaviors upon check-in. 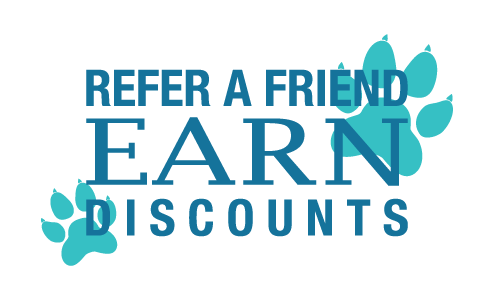 How did you hear about Friendly Paws Pet Resort? Does your pet have a history of biting? Is the pet tagged, tattooed with an identifying number or have a microchip implant? Will pet care responsibilities be shared with anyone else not affiliated with Friendly Paws Pet Resort? *It is important that all spare keys are tested before giving to our staff to ensure we will have access to the home. Friendly Paws is happy to house a spare key for any client that may need multiple jobs done throughout the year. It is the pet owner's responsibility to inform us of any entry lock or garage door code changes to ensure we have the correct means of entry at all times. Our pet sitters will not lock the key in the home after our last scheduled visit in case the pet owner is delayed during travel and needs extra emergency visits. Owner agrees to notify Pet Sitter in the event the Owner is delayed or early returning home. Owner further agrees to pay for any additional visits required, or any visits made if not notified of the Owner returning home early. Owner agrees to communicate any changes made to initial care instructions needed during scheduled visits. If the pet becomes ill while under the care of the Pet Sitter and medical care is needed in the best judgment of the Pet Sitter. Owner authorizes Pet Sitter to transport the pet to a Veterinary facility of their discretion dependent on the severity of the medical care needed. Owner is responsible for all medical expenses and agrees to reimburse the Pet Sitter for any expenses incurred for medical treatment or emergency care. Owner releases Pet Sitter from all liability related to transportation, treatment or expenses resulting from any emergency care or special needs as determined by the Pet Sitter. Pet Sitter is not liable for injury to, or loss of, any pets permitted by the Owner, access to a doggie door, or permitted outside of the house off lead or unattended. In the event of incompatibility, personal emergency, illness, injury or unavailability on the part of the Pet Sitter, Owner authorizes Pet Sitter to arrange for another qualified individual to fulfill the responsibilities set forth by the Owner. It is the Owner's responsibility to ensure their pet is current on all their vaccinations. Should the Pet Sitter be bitten or otherwise injured by the Owner's pet, Owner agrees to pay all medical costs and lost wages incurred due to such injury. Please print your name. This serves as your signature in agreement of the above consent agreement.